Thanks for reading my Lennon musings. Appreciated. A big ship (Lennon) and a rowboat (me). A recall equal parts touching,insightful, ironic and dare I say it – historic! Ps. Has anyone ever told you you bear more than a passing resemblance to Lennon? Hi Glen. Thanks for the kind words. You know, people used to tell me that facially I reminded them of one person or another. But I don’t think anyone ever mentioned JL. Amazing story. I remember reading that John Lennon loved New York because he could be a normal person, unlike in Europe where he was hounded by the press. You saw him enjoying a normal life where he could walk down the street unhindered like anyone else. That’s very special, even if you did not speak to him. Despite his problems, he looked so happy in the Mind Games video. Thank you for sharing your experience. 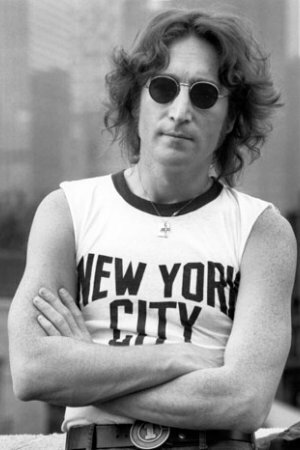 Yes, Lennon loved New York. The USA was lucky to have him living here. What a lovely story! Thank you for sharing. I must be really weird because I wasn’t a huge fan of The Beatles. My mother pretty much only allowed classical music in the house. I didn’t start branching out until I went to college (1979). Neil Diamond was my first concert (Don’t judge!). I did have a celebrity encounter (alas not with a musician): I meet Henry Winkler in an airport. Somehow I got the courage to say: ” Mr. Winkler, I love your work in Royal Pains.” He turned and started talking to me as if he’d known me for years. Nicest guy! Thanks for stopping by, Cristina. My wife loved Royal Pains too. Henry has had a long career. Am encounter with Fonzie would be two thumbs up cool! Funny how one always remembers those “what if’s” in life and yet comes through with a deeper insight into life. Lovely story! Hi. Thanks a lot for adding your thoughts. Yeah, the “what ifs” sometimes can really stick with us. This is a good story, Neil. You and your brother were still in his aura, even if you did not say anything to him. Yeah, I think you’re right to some extent. Lennon was a very smart and creative guy. The world could use him right now. I agree, Neil. One of my favorite songs is “Imagine”-as relevant as ever! Hmmm . . . Very tempting! Maybe he would have said, “Me ‘n Ould baig go’in tigit bevied up. Come ‘ead?” Surely not, “It’s a pleasure, gents”. And you would never say no to that kind of invitation for a drink, eh? JL would have been a great guy to have a drink with, for sure. Morning. Glad you liked the essay. Thanks for stopping by. New York City has always had a cool way of treating celebrities. I read where Joan Crawford was in her final years, almost forgotten, and came across some NYC construction workers. They yelled “Hey Joanie,” and one of them shouted “They don’t make them like you anymore, baby!” The encounter supposedly made her feel like a queen. The Big Apple is a very fine place. No doubt about it. Oh the foolishness of youth where we are too cool to embrace opportunities we would give our eye teeth for as more “mature” adults – Sadly that was never going to happen with JL as he was taken from us far too soon but a great story anyway. Bet you have a fair few other stories from those SoHo days? Hi. Yeah, I’ll probably revisit that era again for this website. Take care, Alyson, and thanks a lot for dropping by. I love that you didn’t disturb him. That’s a much more authentic New York story. I once walked past Ric Ocasek and I’m sure both of us are the better for it, from the point of view of our respective biomes. Elby, I like the word “biome.” Haven’t heard it in a long time. One of the deaths I remember exactly where I was when I heard. I think i’d have been dumbstruck if i’d met him – you were probably just being cool! Hello there, Anabel. One thing for sure is that I missed my chance! Great story, Neil. I would’ve done exactly the same! I wonder if he spoke to people if they gently approached him. Countless folks walked near him on NYC streets. It’s always tricky approaching well-known people – not that I make a habit of it. I remember approaching an England cricketer after play had finished for the day for an autograph for my nephews: he gave the autograph, but without breaking stride, taking off his sunglasses or saying a word; his batting partner (a less renowned player) was much more friendly and stopped to chat. I suppose like us mere mortals it might depend on the mood they’re in! Great story – a true ‘brush with fame’. But would it have been better to have spoken to John Lennon on that day? Probably ‘yes’ but, then again, without the actual exchange, you can imagine endless possibilities that ‘might have been’. Maybe he would have invited you to the studio to hear him record; bought you a slice of that pizza you liked; dedicated his next song to you. Your writer’s mind was given a gift that day. Another thing to thank the great John Lennon for. Hi Carmel. Lennon had such a brilliant mind. His interviews , and of course his music, prove that. Thanks for reminding me of the Beatles……l certainly was a fan! After all these years, their albums still sound great. I’ve been working on some Beatles songs on the guitar, Rocky Racoon, While My guitar gently weeps, fun to see others reflecting on them as well. Got to take the opportunities when they’re presented! I don’t think any musical act ever had the worldwide cultural influence that The Beatles did. They were the kings of the world. Great story, and I understand your regret; however, it’s also true that one of the best things about New York is that the brightest and best stars can walk the streets, and maybe people nod, but that’s about it. That was one of the coolest things about New York. Right, the Big Apple is cool. Thanks for stopping by, Janet. Appreciated. Thanks for these comments, Jerry. You have excellent things to say. If it had been me, I’m not sure if I would have spoken either. But at least you saw him, and now you can imagine how the conversation might have gone! Ann, I appreciate your stopping by. Having spent my own period of time totally under the spell of the Beatles, I enjoyed every word of this post. I fear I would have reacted the same way had John Lennon walked by me and would have regretted not speaking in the same way as well. Of the two salutations you considered, I think ““Hey, man. Thanks for all the great music you’ve made,” sounds much more like you than, “Hello, John. Fancy meeting you here,” which, of course, is strictly my opinion. At the very least I should have smiled and nodded at him. Thanks for visiting, Janet. I appreciate it. I got to New York in 1974 from California. I had been used to seeing celebrities on the street, having come from living and working in and around Hollywood. And I always acted blase. What a shame I never said hello or thanked anyone for the past pleasures they had given me. Hello Emilio. Thanks a lot for adding your thoughts. I imagine that quite a few celebs appreciate it when fans tell them that their work is admired and meaningful. Leif Garrett is a jerk! Still waiting from anyone for stories of brushes with Clint Eastwood, Al Pacino or Robert DeNiro. Well, at a show in NYC once, Liza Minelli squeezed past me to get to her seat. That’s about the only other celeb encounter I can recall having. Liza and JL count as twice in one lifetime. But might I suggest you now step out of the celebrity path and give someone else a chance? Dangit! This is a very cool story. Thanks a lot, Kathy. I appreciate that. Great piece, Neil. You inspired today’s post on my blog. Thanks very much, Anthony. I really appreciate that. But if John had had the fragile beginnings of the One Day (At A Time) melody forming in his head, had you interrupted him at that critical moment, it might have been lost forever! Ah, now that’s an interesting, new viewpoint! Thanks for the visit, George. Good to hear from you. Love the first two sentences of the second lat paragraph. Words to live by. A friend of mine met Muhammad Ali. When he tried to speak his tongue gained about 10 lbs and all he could do was grunt. I’d probably have done the same as your friend if I’d met Ali. You got a great way with words. I, too, was floundering magnificently in the game of life. The story you tell reminds me that during the 60s, by some serendipitous event, I found myself in the studio while the St Pepper cover was created. I helped, cutting out the cardboard image of Shirley Temple. I wasn’t allowed to take photographs, though I should have. In any case, I was too dumb to appreciate the historic event. It was however the occasion when I smoked my first proper joint, since there was an irresistible large chunk of marijuana on a plate, with a little knife, and everyone was free to it. I also remember Anita Pallenberg in high boots making a lavish entry to the scene. You’ve got a story for the ages. Ok, Christy’s thought scoops the ‘Comment of the Post’ award. Christy definitively came up with a good one. Great story. My connection with John Lennon is that, like me, he got married in Gibraltar in 1969. Hi Stuart. Thanks for dropping by. That’s definitely an amazing coincidence. Good story. What’s usually the best about these impromptu interactions with famous people we admire is not so much what is said but the feelings they evoke in us as a result of the encounter – and the memories they awake. Chances are it wouldn’t have been any more meaningful had you say hello to John. Your “interactions” with him were meaningful enough, right? I can’t disagree. Still, I wish I had said something to him. About 10 years ago, I had a dream about John Lennon. It was one of the three celebrity dreams I’ve had that was so sparklingly vivid that when I first read your story, I thought, “Wow, I’ve also seen John Lennon and didn’t speak to him, but at least I had meaningful eye contact with him.” It was a full few seconds until I remembered that my encounter was just a dream. You definitely had a powerful dream. To remember it after all these years is really something. I agree with your analysis. Life, I suppose, is partially a series of “what ifs”. I take my hat off to you for a post with such great interactions. Years ago I worked in Liverpool and mentioned John Lennon to one of my customers. He told me that lennon’s childhood home was just around the corner and when I drove off that way I came across iit immediately. Menlove crescent where he lived with his aunt Mimi. Hi, Steve. Thanks for the compliment. Appreciated. You know, the world could really use John Lennon these days. He would help to counterbalance jerks like Trump. Great story, Neil! And a great moral! You played it right the first time. No, I should have nodded and said hello.